Whether you’re building a whole house or just adding a new bathroom, one of your first decisions has to be how you’re going to heat the space. Hydronic, or water-circulating, radiant systems are best for new construction or large additions. They can be installed just below the subfloor between the joists, directly under tile or hardwood flooring, or even inside a concrete floor slab. Where you only need to heat a small space like a bathroom or finished basement, electric radiant is an easy option. 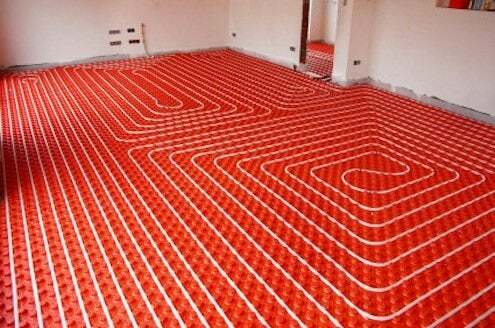 Electric radiant mats can be installed directly under tile and are ideal over a concrete subfloor. You don’t have to design around ductwork or baseboard units, and a small room heated this way uses less than 15 cents of electricity per day.